If the wind would blow perfectly in the right direction, everything would just fall in place. Or so that is what we thought. We can make wonderful plans and then sit back and wait for everything to just fall in place and carry us on an awesome journey. The problem with this thinking is that we have no control over the wind. 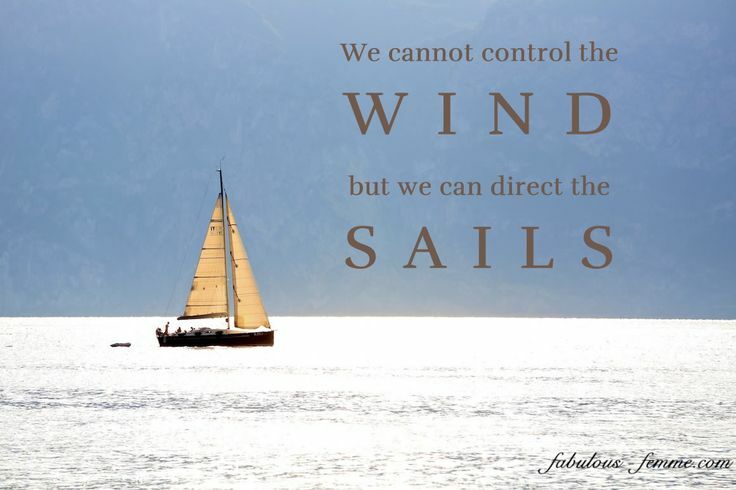 If we aren’t adjusting our sails and directing our boat, we won’t go in the right direction. We make plans. Those plans don’t work out so we make new plans. Those plans don’t work out so we make new plans. And it goes on and on and on. At no time have we adjusted our sails to help our plans along. Instead, we sit back and wait for the wind to come along and push us toward our plan. What we’ve learned is that working harder for something isn’t necessarily going to make things happen. When something isn’t working the way we hope, we need to adjust. We need to make changes in our approach. It’s the definition of insanity – doing the same things over and over again expecting different results. With a plan in place, we’re adjusting our sails. We’re doing things differently. We’re letting go of the insanity.